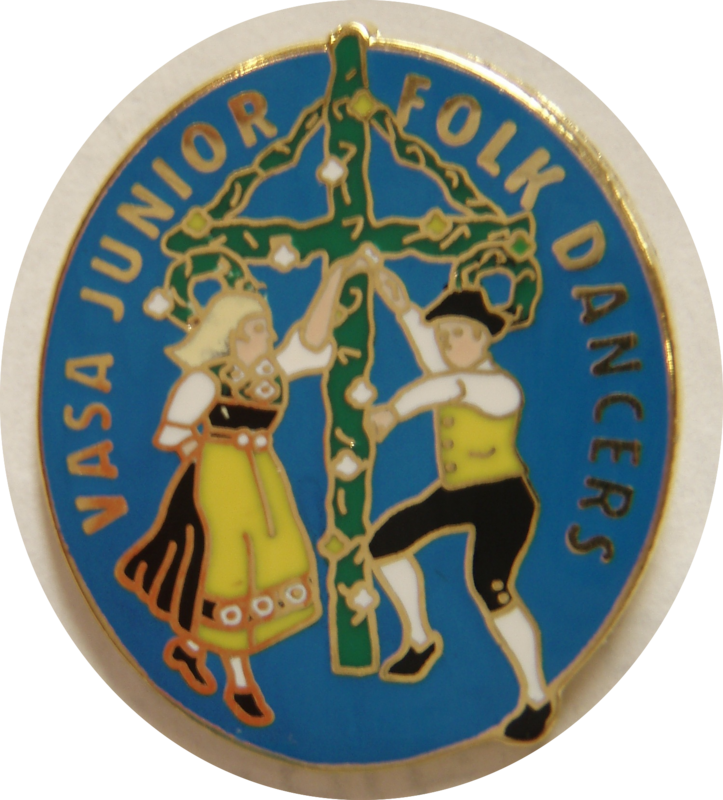 The Vasa Junior Folk Dancers, of Minnesota. The VJF dancers learn a variety of Swedish folk dances, songs & cultural customs. 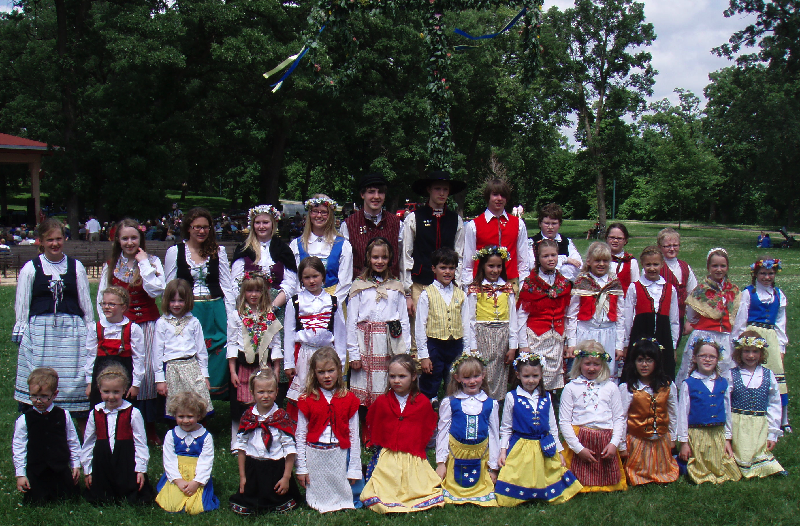 The folk dancers are sponsored by the four Vasa Lodges in the Minneapolis/St. Paul area. Parents (and dancers 14 years and older) are encouraged, but not required, to join one of the Twin Cities Vasa Lodges, including: 137-RUNEBERG, 138-STENBOCK, 433-KRONAN, and 488-JOHN MORTON. Parents and dancers are welcome to visit lodge meetings. Practice generally takes place on the 2nd and 4th Saturday, at 1:00 pm, at ASI. The normal practice season is from the 4th week of September to the 2nd week of May. 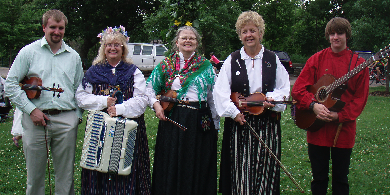 Throughout the year, the group may be invited to perform at other Vasa programs, church functions, community festivals (such as Nordic Fest), and nursing homes. Antonio Spargo (fiddle), Carolyn Sparto (piano accordion & Music Director), Cheryl Olson (fiddle), Julie Anderson (fiddle), Thomas Spargo (acoustic guitar). The annual membership fee is $20 per family and is collected by the Parent's Club. It is used for activities, crafts and parties for the children. The Parent's Club also organizes several fund raising events in support of the folk dance group. Dancers wear a folk costume that reflects the province or area they or their ancestors are from in Sweden. Dancers may also wear the yellow and blue national folk costume. New members will receive information on purchasing costume patterns, supplies or securing an experienced seamstress. What do the Dancers like about the group? What do Parents like about the group? "We wanted to learn more about our family's Swedish heritage and have included the cultural traditions we've learned during the Christmas holiday." "The practice schedule isn't overwhelming and the participation costs are so much less than other types of dance groups." "It's a great opportunity for both children & parents to get involved with." "My daughter really enjoys dancing & playing with the other kids, she can't wait until she is old enough to be chosen as the group's Santa Lucia." To view the below Youtube links, please right-click and select "Open Link in New Tab". See also our YouTube Channel. * This Youtube video "Midsommar 2008.m4v" features the Vasa Jr. Dancers between 0:52 & 1:17. * This Youtube video "Swedish folk dance fight - Oxdansen" features a pair of men doing an Ox Dance that's closer to "normal". The "info@vasajrdancers.org" E-mail address forwards to the Parent's Club's President, Webmaster, Treasurer as well as three of the Instructors, and the Music Director. Note re 2014: An ASI staff member indicated (in approx. 2010) that in the year(s) 2014 (and 2025) the ASI Midsomer/Maypole event would likely be shifted up a week, to June 14th (not the 21st). In these two years the 3rd Saturday is immediately followed by the 4th Sunday. This change maintains the 8 days separation from Svenskarnas Dag. ...but we're not quite there just yet.